2-room apartment of 40 m2 at ground floor. The garden overlooking the lake, of 3.000 square meters, is located at 100 meters from the house. At exclusive use of the hosts are included: garden chairs, barbeque, canoes and bicycles. The apartment is well furnished and is composed of living - dining room - kitchen (with a comfortable double sofa bed) and 1 bedroom with a fireplace. In the house courtyard table, chairs and barbeque. Private parking at 50 mt from the house. Silent house, ideal for a relaxing holiday. 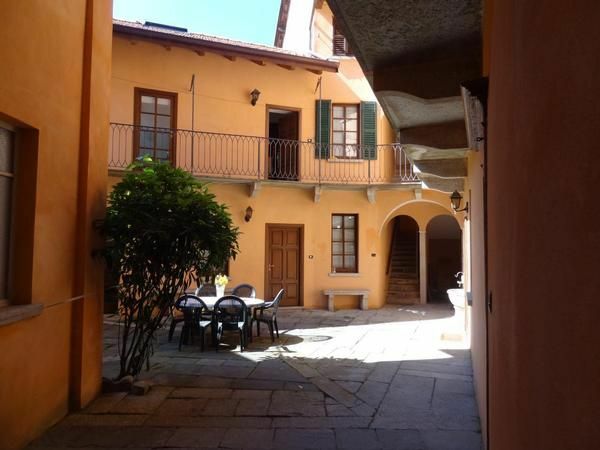 The apartment is situated in a House from the 17th century with inner courtyard and a private garden overlooking the lake. The lake water is very clean and is perfect for a pleasant swim. Hiking, biking, restaurants and agritourism, wine tours visits of Orta, San Giulio Island, Mottarone (beautiful view from which you can see 7 lakes), Madonna del Sasso, Milan, Turin,Villa Taranto, Stresa and much more complete the holiday. Bed linen (once per person, vorhanden 5 EUR). Towels (once per person, vorhanden 5 EUR).